KANSAS CITY, Mo. (AP) — Patrick Mahomes walked off the field at Arrowhead Stadium on Sunday with another record on his resume and the Kansas City Chiefs another win toward earning the No. 1 seed in the AFC playoffs. He didn’t have much chance to savor any of it. 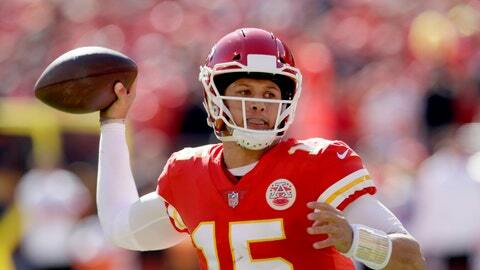 Mahomes quickly learned that the stepfather of his longtime girlfriend, Brittany Matthews, had died after a medical emergency during the game. Mahomes quickly skipped out on the postgame celebration and joined Matthews, who posted the sobering news on her social media accounts that evening. Mahomes is not expected to miss any preparation for Monday night’s showdown with the Rams in Los Angeles, though Chiefs coach Andy Reid said he would be fine if it happens. The Chiefs were off Tuesday and Wednesday, giving Mahomes and his family time to cope. This season has already been a whirlwind for Mahomes, who was thrust into the starting job after the trade of Alex Smith to Washington and whose ability was justifiably questioned. He was a product of the Texas Tech offensive system. His big arm was tempered by problems with his accuracy. He had leadership abilities, but could they translate from college to the NFL? Mahomes has answered all those questions every week. He threw six touchdown passes in a game. He led the Chiefs to tough road wins over the Chargers and Steelers, and went toe-to-toe with Tom Brady in New England. He has thrown so few interceptions that any questions about his decision-making have been left in September. With two more TD passes against the Cardinals, he broke the franchise single-season record of 30 that Hall of Fame quarterback Len Dawson set during the 1964 season — with six games to go. Well, the Chiefs probably didn’t need all of them. The Chiefs have scored 353 points through their first 10 games, the most in club history, and have been held to fewer than 30 only twice. Three times they’ve scored more than 40, including their 43-40 loss to the Patriots that remains the only blemish on their record. To put into perspective just how good Mahomes has been this season, consider this: He threw for 249 yards against the Cardinals for a passer rating of 125.4, the eighth time this season he’s been over 100.0 — the third most in a single season in franchise history. Yet some people considered the end of his streak of eight consecutive 300-yard passing games to be a relative disappointment, as if he failed to live up to some otherworldly expectation. His teammates certainly weren’t in that camp. He’s been far better than that this season. Oddsmakers in Las Vegas have made the 23-year-old Mahomes the front-runner to win the league’s MVP award, ahead of Saints quarterback Drew Brees and Rams running back Todd Gurley. And if he keeps going at his current rate, he will no doubt continue to rewrite the Chiefs record book. Maybe even the page that lists the Chiefs’ rather unimpressive postseason history.